Two Small Ships from WWI: Whose guns sank M30? M£0 still ablaze on the day after she was hit. See Chapter 8, Just a Number (right). It is often said that the history of wars is always written by the victors so it is good that this article relies heavily on the researches of Gunter Hartnagel, an expert on the use of German artillery in the Gallipoli campaign, with whom I hope I can remain in in contact, and Peter Jung who was working for the Austrian State/War Archive War Archive when he died in 2003. Shortly after Admiral Souchon arrived in Constantinople on 10 August, 1914, with the German warships Goeben and Breslau, he asked for additional support from his government in providing a defence for the Dardanelles, a request which supported by Enver Pasha, the Turkish Minister of War, and was repeated during the fight for the Gallipoli peninsula. However, little material help was able to pass through the Balkans until Serbia was defeated in the autumn of 1915, and supply lines were opened. Two Austro-Hungarian artillery units, the Haubitzbatterie No.36 and Motormorserbatterie No.9, were then transported down the Danube and, arriving on station at the end of November, played a vital part in the final 5 weeks of conflict before the last invading Allied soldiers were driven from the Gallipoli peninsula during the night of 8/9 January, 1916. 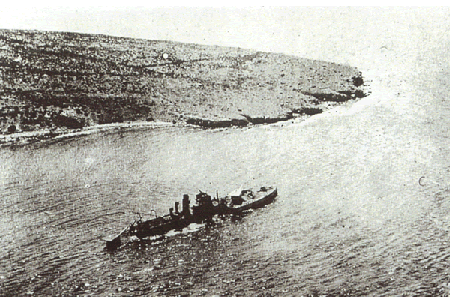 The subsequent Allied occupation of Long Island (Chustan) in the Gulf of Smyrna posed a threat to the city itself and, after a visit to the area to review the situation, General Liman von Sanders ordered the Haubitzbatterrie No.36 to relocate in a protective position covering Smyrna thus providing a well trained and efficient force to reinforce the Turkish gunners manning the coastal defences of the Gulf. 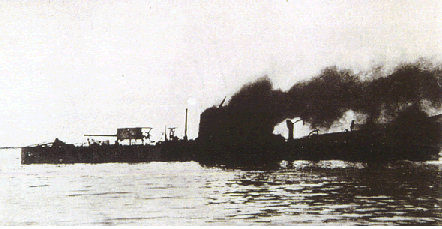 During the spring of 1916 the Turks moved to bring Long Island under fire from all sides but transporting heavy artillery over broken ground was extremely difficult, particularly through the wild countryside of the Kara Burnu peninsula, so General General Liman von Sanders asked his fellow countryman Admiral Souchon, now commanding the Turkish Navy, for help. As a result 2 daring voyages from Smyrna to Cape Aspro (mentioned in Chapter 8) were made by vessels under the overall command of Oberleutnant Missuweit of the German Navy carrying howitzers, ammunition, gun crews and staff from the Haubitzbatterie No.36. The guns were mounted in pits already prepared for them in a position south of Mordovan and opened fire on Long Island for the first time on 6 May in cooperation with Turkish batteries. German reports suggest that it was the guns of the No.36 battery which sank M30 during the evening of 13 May and, given the accuracy of the shelling as reported by M30’s captain, Lt.Commnander Lockyer, this seems a more likely conclusion than it was the result of fire from by their Turkish counterparts. The fires have died out: M30, aground, awaits the salvage party. See Chapter 8, Just A Number (right). The well planned covert evacuation of Long Island was carried out so efficiently over the nights of 26, 27 and 28 May that the Turkish H.Q. did not discover that the entire Allied force had left until over a fortnight later when a small German naval detachment, armed with 8 machine guns, was dispatched from Gul-Bache Bay, to examine the situation on the island. This patrol was commanded by Oisberleutnant Missuweit and consisted of 3 other officers and 12 private soldiers.